I lost my quilting mojo for awhile. After returning from Barcelona, I was so jazzed to be sewing again that I ended up piecing my brown bag challenge quilt in a 8-hour sewing marathon. 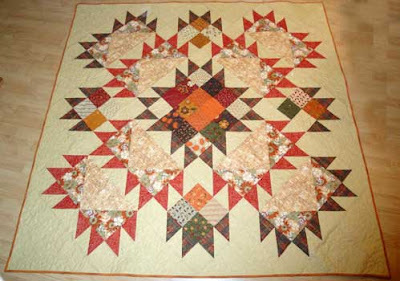 Then, the quilt top sat on my floor for a month taunting me. I responded by walking all over it as if it were a new rug. 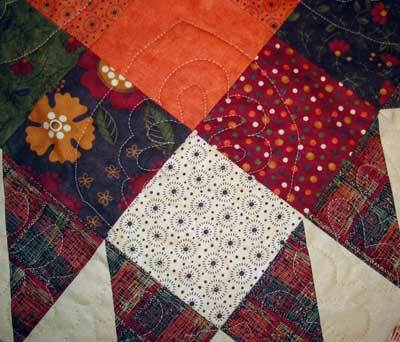 There is always some aspect of making any quilt that drags for me. In this case, it was the actual quilting. It started out exciting enough. Practicing quilting leaves, vines and spirals free hand. Then the tension on the sewing machine was finicky causing eyelashing on the back (really annoying). Then I kept having to change the bobbin and because of how I had my machine set up for quilting, another minor annoyance. Enough whining. It's finally finished: quilted and bound. I had thought I would be fancy and do some non-stipple quilting all over (the leaves, vines, and spirals), but the quilting got tiresome toward the end and I just wanted to finish. So rather than do some peacock type quilting in the large setting triangles as originally planned, I made do with stippling. It's fine and a run through the washer and dryer I'm sure will do the trick to make this into a snuggable quilt. At the very least, I finally have my fall quilt. This quilt is my response to the Brown Bag Quilt challenge from Stash Manicure. My quilting partner gave me a half-yard each of the green plaid and red floral (used to make the paws in the bear claw block) and yellow basket weave and large floral (used to make the body of the large bear claw blocks). I ended up using 98% of the challenge fabric; only a 2" x 6" piece of each fabric was left over. The cream and the Gobble Gobble 5" squares in the rest of the quilt are from my stash and so is the back, per the rules, so I did not need to buy any additional fabric, making this project very budget friendly. The pattern is "Nice Day" by Carrie Nelson from her book Schnibbles times two. Now that this is off my floor, I can begin making some new quilts as I generally don't like to have more than one quilt top to actually quilt at a time. And have a new temporary rug taunting me.